Alessandro Cutilli recently graduated from University of Padua (Italy) and has joined the Coffer Lab to work on a collaborative project together with Caroline Lindeman’s group focusing on CD4+ T cells in graft-versus-host-disease. Graft-versus-Host-Disease is the most life-threatening complication following allogeneic hematopoietic stem cell transplantation (HSCT) where patients are transplanted with a combination of donor hematopoietic stem cells and lymphocytes. Despite treatment and prevention strategies GvHD with intestinal and liver involvement still has around a 30% mortality rate and forms a large urgent unmet medical need. Transferred alloreactive T cells respond in a complex manner, and the reasons for induction of GvHD, while involving inappropriately targeted CD4+ T cell activation, remain largely unclear and difficult to predict. Devising strategies to transiently "inactivate" T cells that mediate unwanted immune responses will have important implications for the control GvHD after bone marrow transplantation. Existing therapies, such as steroid-treatment, tend to broadly suppress undesirable immune responses, are often ineffective, and can trigger a variety of unwanted side effects. This is particularly dangerous in transplant patients who are extremely susceptible to infection. One critical control mechanism that ensures peripheral T cells avoid inappropriate activation is the induction of anergy, a hyporesponsive-state where cells don’t proliferate or produce cytokines and are more resistant to subsequent stimulation. Our recent preliminary data has shown for the first time that it is possible to induce anergy in CD4+ T cell populations by inhibiting (macro)autophagy, even in hyperactivated cells. Alessandro will be further investigating this using complex in vitro 3D cell culture systems as part of the EU COFUND RESCUE consortium. Congratulations to Dr. Janneke Peeters who has successfully defended her PhD thesis entitled: “Transcriptional and epigenetic mechanisms underlying autoimmune diseases”. Autoimmune diseases are complex and the various molecular mechanisms that contribute to autoimmune pathogenesis as still poorly understood. The work described in Janneke’s thesis is aimed to create insight into molecular mechanisms underlying autoimmune disease, focusing on epigenetic regulation and autophagy. 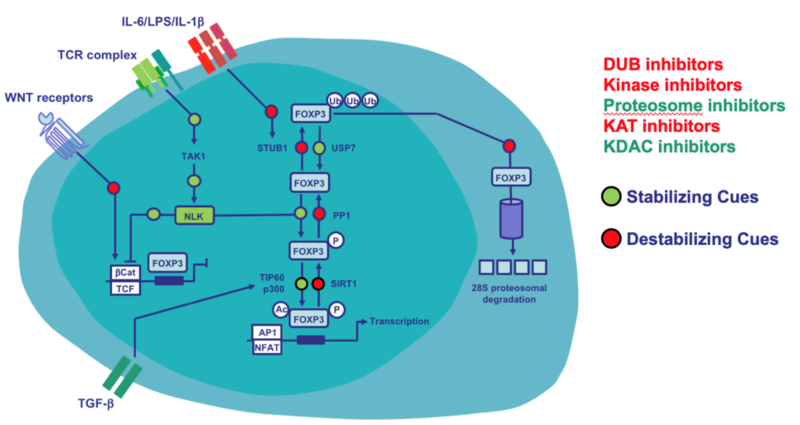 These studies provide novel insight into transcriptional and epigenetic mechanisms in an autoimmune disease setting and demonstrate that altered enhancer regulation and autophagy is associated with autoimmunity. Furthermore, these findings indicate that targeting these molecular mechanisms might be of interest for the treatment of autoimmune diseases. Janneke will soon be starting a postdoc position at University of California Berkeley with Dr. Michel DuPage where she will be utilizing sophisticated genetic tools to modify T cells and tumor cells in the context of pre-clinical cancer models. 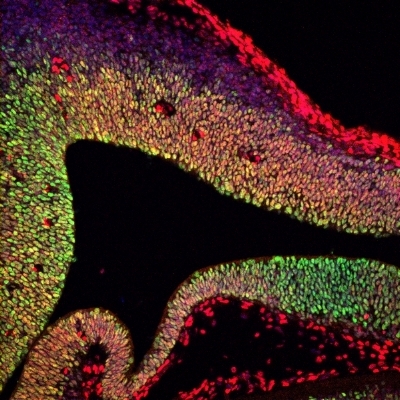 SOX4 has been shown to promote neuronal differentiation both in the adult and embryonic neural progenitors. Ectopic SOX4 expression has also been shown to inhibit oligodendrocyte differentiation in mice, however the underlying molecular mechanisms remain poorly understood. Here we demonstrate that SOX4 regulates transcriptional targets associated with neural development in neural stem cells (NSCs), reducing the expression of genes promoting oligodendrocyte differentiation. SOX4 levels decreased during oligodendrocyte differentiation in vitro while SOX4 knockdown induces increased oligodendrocyte differentiation. Conversely, conditional SOX4 overexpression decreases the percentage of maturing oligodendrocytes, suggesting that SOX4 inhibits maturation from precursor to mature oligodendrocyte. We identify the transcription factor Hes5 as a direct SOX4 target gene and we show that conditional overexpression of Hes5 rescues the increased oligodendrocyte differentiation mediated by SOX4 depletion in NSCs. Taken together, these observations support a novel role for SOX4 in NSC by controlling oligodendrocyte differentiation through induction of Hes5 expression. This work was performed by Luca Braccioli as part of his thesis project in the Coffer Lab and has been published in Stem Cell Reports. T cell factor, the effector transcription factor of the WNT signaling pathway, was so named because of the primary observation that it is indispensable for T cell development in the thymus. Since this discovery, the role of this signaling pathway has been extensively studied in T cell development, hematopoiesis, and stem cells; however, its functional role in mature T cells has remained relatively underinvestigated. Over the last few years, various studies have demonstrated that T cell factor can directly influence T cell function and the differentiation of Th1, Th2, Th17, regulatory T cell, follicular helper CD4+ T cell subsets, and CD8+ memory T cells. In a recent review paper in Journal of Immunology with Jorg van Loosdregt, we discuss the molecular mechanisms underlying these observations and place them in the general context of immune responses. Furthermore, we explore the implications and limitations of these findings for WNT manipulation as a therapeutic approach for treating immune-related diseases. You can find out more here.